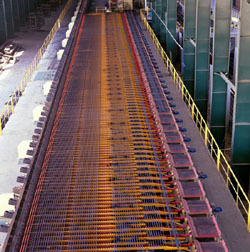 MISR NATIONAL STEEL ( ATAQA ) holds a very considerable and increasing share of the local Egyptian market. It has also a large network of clients based in the MENA region. The above is supported by meeting all the customer requirements and producing reinforced steel bars according to local and international standards. Thanks to the high quality product and the highly qualified marketing team, MISR NATIONAL STEEL ( ATAQA ) is considered as one of the market leaders of the domestic and international markets. We are very proud that our Hadidna brand is the sign of quality approved by consultant engineers and favored by construction contractors.